Diabetic retinopathy, the most common diabetic eye disease, occurs when blood vessels in the retina change. Sometimes these vessels swell and leak fluid or even close off completely. In other cases, abnormal new blood vessels grow on the surface of the retina. Diabetic retinopathy usually affects both eyes. People who have diabetic retinopathy often do not notice changes in their vision in the diseases early stages. But as it progresses, diabetic retinopathy usually causes vision loss that in many cases cannot be reversed. Background or Non-Proliferative Diabetic Netinopathy. Non-proliferative diabetic retinopathy (NPDR) is the earliest stage of diabetic retinopathy. With this condition, damaged blood vessels in the retina begin to leak extra fluid and small amounts of blood into the eye. Sometimes, deposits of cholesterol or other fats from the blood may leak into the retina. 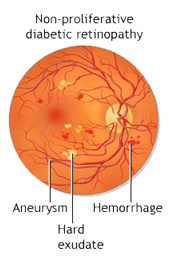 Microaneurysms: small bulges in blood vessels of the retina that often leak fluid. Retinal haemorrhages: tiny spots of blood that leak into the retina. Hard exudates: deposits of cholesterol or other fats from the blood that have leaked into the retina. Macular oedema: swelling or thickening of the macula caused by fluid leaking from the retinas blood vessels. The macula does not function properly when it is swollen. Macular oedema is the most common cause of vision loss in diabetes. Macular ischemia: small blood vessels (capillaries) close. Your vision blurs because the macula no longer receives enough blood to work properly. Many people with diabetes have mild NPDR, which usually does not affect their vision. However, if their vision is affected it is the result of macular oedema and macular ischaemia. Vitreous haemorrhage: delicate new blood vessels bleed into the vitreous (the gel in the centre of the eye) preventing light rays from reaching the retina. If the vitreous haemorrhage is small, you may see a few new, dark floaters. A very large haemorrhage might block out all vision, allowing you to perceive only light and dark. Vitreous haemorrhage alone does not cause permanent vision loss. When the blood clears your vision may return to its former level unless the macula has been damaged. Traction retinal detachment: scar tissue from neovascularization shrinks, causing the retina to wrinkle and pull from its normal position. Macular wrinkling can distort your vision. More severe vision loss can occur if the macula or large areas of the retina are detached. Neovascular glaucoma: if a number of retinal vessels are closed, neovascularization can occur in the iris (the coloured part of the eye). In this condition, the new blood vessels may block the normal flow of fluid out of the eye. Pressure builds up in the eye, a particularly severe condition that causes damage to the optic nerve. Blood sugar levels - Controlling your blood sugar is the key risk factor that you can affect. Lower blood sugar levels can delay the onset and slow the progression of diabetic retinopathy. Blood pressure - A major clinical trial demonstrated that effectively controlling blood pressure reduces the risk of retinopathy progression and visual acuity deterioration. High blood pressure damages your blood vessels raising the chances for eye problems. Target blood pressure for most people with diabetes is less than 130/80 mmHg. Duration of diabetes - The risk of developing diabetic retinopathy or having your disease progress increases over time. After 15 years 80% percent of Type I patients will have diabetic retinopathy. After 19 years up to 84% of patients with Type II diabetes will have diabetic retinopathy. Blood lipid levels (cholesterol and triglycerides) - Elevated blood lipid levels can lead to greater accumulation of exudates, protein deposits that leak into the retina. This condition is associated with a higher risk of moderate visual loss. Pregnancy - Being pregnant can cause changes to your eyes. If you have diabetes and become pregnant your risk for diabetic retinopathy increases. If you already have diabetic retinopathy it may progress. However, some studies have suggested that with treatment these changes are reversed after you give birth and that there is no increase in long term progression of the disease. The best treatment for diabetic retinopathy is to prevent it. Strict control of your blood sugar will significantly reduce the long term risk of vision loss. Treatment usually will note cure diabetic retinopathy nor does it usually restore normal vision, but it may slow the progression of vision loss. Without treatment, diabetic retinopathy progresses steadily from minimal to severe stages. The laser is a very bright, finely focused light. Laser shrinks abnormal new vessels and reduces macular swelling. Treatment is often recommended for people with macular oedema, proliferative diabetic retinopathy (PDR) and neovascular Glaucoma. With laser treatment for macular oedema, tiny laser burns are applied near the macula to reduce fluid leakage. The main goal of treatment is to prevent further loss of vision by reducing the swelling of the macula. It is uncommon for people who have blurred vision from macular oedema to recover normal vision, although some may experience partial improvement. In PDR, the laser is applied to all parts of the retina except the macula (called PRP or pan retinal photocoagulation). This treatment causes abnormal new vessels to shrink and often prevents them from growing in the future. It also decreases the chance that vitreous bleeding or retinal distortion will occur. Pan retinal laser has proven to be very effective for preventing severe vision loss from vitreous haemorrhage and traction retinal detachment. Multiple laser treatments may be necessary over time. Laser does not cure diabetic retinopathy and does not always prevent further loss of vision. In some cases, medication may be used to help treat diabetic retinopathy. Sometimes a steroid medication is used. In other cases you may be given an anti-VEGF medication. This medication works by blocking a substance known as vascular endothelial growth factor or VEGF. This substance contributes to abnormal blood vessel growth in the eye which can affect your vision. 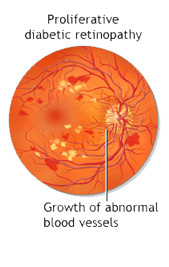 An anti-VEGF drug can help reduce the growth of these abnormal blood vessels. After your pupil is dilated and your eye is numbed with anaesthesia, the medication is injected into the vitreous, or jelly like substance in the back chamber of the eye. The medication reduces the swelling, leakage, and growth of unwanted blood vessel growth in the retina and may improve how well you see. Medication treatments may be given once or as a series of injections at regular intervals, usually around every four to six weeks or as determined by Mr. Golchin. Vitrectomy is a surgical procedure performed in a hospital operating room. Either a local or general anaesthetic may be used. Vitrectomy often prevents further vitreous haemorrhage by removing the abnormal vessels that caused the bleeding. Removal of the scar tissue helps the retina return to its normal location. Laser surgery may be performed during vitrectomy surgery. To help the retina heal in place, your retinal specialist may place a gas or oil bubble in the vitreous space. You may be told to keep your head in certain positions while the bubble helps to heal the retina. It is important to follow your ophthalmologists instructions so your eye will heal properly. Mr. Behrooz Golchin has been my Consultant Ophthalmic Surgeon for two years. His consulting rooms immediately relax me before I have my meetings and operations with Mr. Golchin. I have had several eye tests and operations with Mr. Golchin. Mr. Golchin prepared me for every step of the operation in detail and as a result I have absolute confidence in him. I am 100% completely satisfied with the results of my operation and dealings with Mr. Golchin who in my estimation is a thorough gentleman.